You heard of Valentine’s Day but have you heard of Singles Day? Like, the opposite of Valentine’s Day where you spend 24 hours celebrating your “singleness”. Singles Day is an entertainment festival popular among Chinese youth. This festival originated in 1993 when a group of university students in China chose to celebrate being single. The festival is set to take place every year on November 11th because “11/11” looks like four single guys in a row. 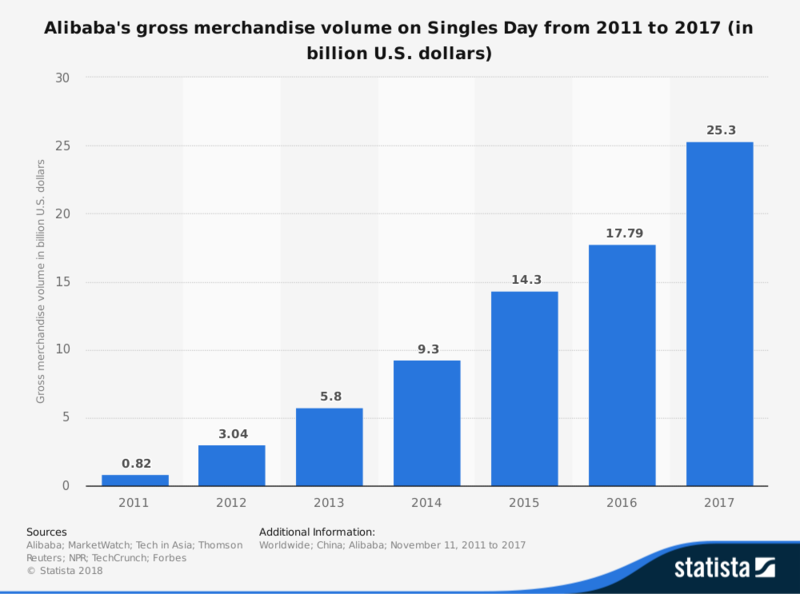 In 2009, Chinese e-commerce giant Alibaba Group launched the first ever Singles Day shopping festival on taobao.com, and it immediately became a yearly trend. Most businesses on taobao.com reduced their prices on this day to receive staggering amounts of online orders. Singles Day slowly became a shopping festival and Alibaba trademarked the event as “Double Eleven Shopping Festival”. During the initial Singles Day Shopping Festival in 2009, only 27 online stores participated in the event. Alibaba reported 52 million RMB (around seven million U.S. dollars ) worth of transactions were made within 24 hours. In 2017, and the sales number became $25.3 billion U.S. dollars , which surpassed the combined sales of Black Friday and Cyber Monday in the United States during the same year. Alibaba also reported that their online shopping platform Taobao, received 812 million orders and more than 90 per cent of these orders are received through mobile client. Singles Day 2018 generated more than a billion of packages and the postal services reassigned more than two millions of postal workers to handle the packages. The automated system behind the shopping site can handle 20,000 packages per hour. Every Singles Day event in the recent years were accompanied by live events featuring domestic and international celebrities. Alibaba has invited guest such as David Beckham, Daniel Craig and Miranda Kerr to hype up the crowds. A live tracker is shown on the monitor behind to demonstrate the live sale account. The tracker will run for 24 hours and records every transactions in detail. China’s booming population is a driving force of any shopping festival in the country. The nation had an urban population of 730 million in 2015 and the majority of working adults earned between $9,000 U.S. dollars and $16,000 U.S. dollars per year. While this amount of income in U.S. dollars looks dismal in the western world, an annual salary of over 100,000 RMB ($16,000 U.S. dollars ) is considered wealthy in China. According to the Boston Consulting Group, Chinese consumption is expected to grow nine per cent per year through 2020. Overall, the Chinese consumer economy is expected to grow by 55 per cent. Another factor that supported the increase of Chinese consumer spending is the household debt level of China. The nation’s household debt-to-GDP is only 40 per cent, less than half of the American debt-to-GDP at 88 per cent. Online shopping is growing fast in China thanks to the contribution of the Alibaba Group. Online shopping in China accounts for 16 per cent ($672 billion U.S. dollars ) of all domestic consumer spending. On the international stage, China accounts for 35 per cent of global online shopping. 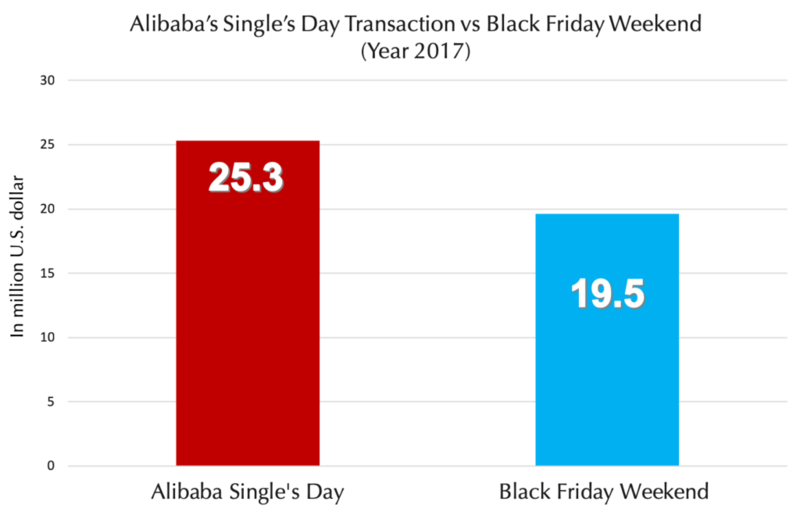 According to eMarketer, about half of Chinese online shopping is conveniently conducted on a mobile device. Chinese economy has experienced slow growth in the recent two years especially after the sudden drop of Chinese stock in 2015. Billions of dollars were wiped off across the world and Shanghai Composite suffered an 8.5pc decline, the worst one since 2007. Despite the slowed economy, a 2015 Nielsen survey of 1,000 Chinese Internet users showed that average Chinese consumers were willing to spend 1,761RMB ($255 U.S. dollars ), 22 per cent more than the values of 2014, during the annual Singles Day sale. In western countries, consumers use Black Friday as a day to shop for the holiday season. Unlike western countries, Christmas is not a national holiday in China. Instead, the Chinese people have Spring Festival, which is another word for Chinese New Year. Chinese New Year is usually set in late January or early February. The festival is famous for generating the “Chunyun” phenomena, the largest annual human migration in the world. 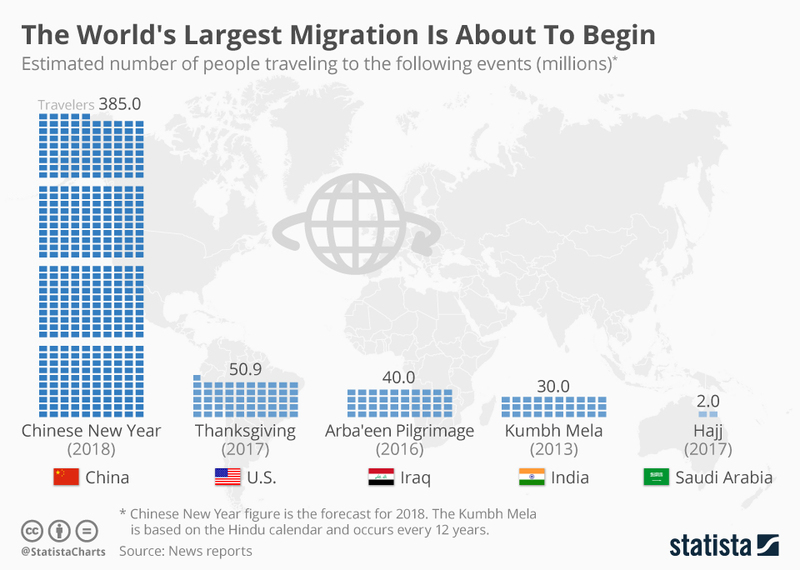 According to the National Statistic Bureau of China, the total passenger volume during Chunyun in 2018 was about 385 million people. During the two weeks Chunyun period, people from all over China are travelling back to their hometown and spend the new year with their families. The second most popular holiday in China is the National Day Holiday in early October. The locals referred the National Day Holidays as the “Golden Week” because it is a booming travelling season. It is estimated that more than 700 million people in China each year are travelling to domestic and international destinations. There are no shopping festivals in China prior to 2009, Singles Day is magically placed in the middle of the two travelling seasons to avoid the overflow of people and postal services. Alibaba believed that people are generally tired of going to physical stores especially when they just returned from the holiday. Hosting a huge sale in the middle of November can easily boost consumer interests and remove stress out of their work. Consumers can use this shopping festival to stock up ahead of the Spring Festival retail boom. Also, what better ways to celebrate singleness than to…. shop?